The world of boats is full of chagrined aphorisms. In sailing circles B.O.A.T. has come to be understood to mean ‘Break Out Another Thousand,’ and for some, ‘Boat Unit’ is defined as an amount of money it takes to fix anything and commonly understood to be roughly $1,000. The ‘second happiest day’ in a boat owner’s life refers to the day the boat sells, and advice given to prospective boat owners often includes that instead of buying a boat, they should just rip up hundred dollar bills while taking a cold shower. A boatbuilder we know told us that the best way to estimate how much it will cost to build a boat was to add up all of the materials that would go into it, then add up all the time it would take to do everything, and while common wisdom says you should take that total and double it, in his experience you should double it, double it again, and then add 30%. What does this all mean? Our take: boats inspire pessimism of the present, optimism for the future, and everything takes way longer than even the pros think it will. Team Seaforth Expeditions’ application cruised into the R2AK command bunker in 2018 with the same gritty optimism as many who get inspired by the coastline and $10,000 nailed to a tree. There is a subspecies of racers who don’t just want to do the race, but build the boat for it; still others who don’t just want to build a boat, but design and build the perfect craft that, to date, has never existed outside of their own brains. Team Seaforth is the latter, and their idea was to tech/armor up a traditional sailing Sharpie. Sharpies were shoal water workboats of the 1800s, most famously used for catching oysters in New England or delivering mail in Florida. 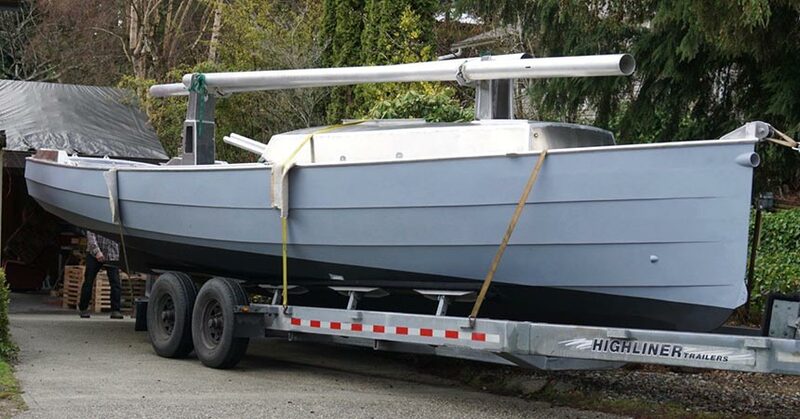 Long and narrow hull, big simple rig, and a centerboard that can lift up and allow boats as big as 50’ to put their bow right on the beach to deliver mail, catch oysters, or just not get your feet wet when going ashore. Seaforth sallied forth and designed a modern one made from aluminum and complete with a bowsprit, 8 rowing stations, and the ability to sleep everyone below in accommodations that, given the boat’s aluminum nature, can only be described as ‘sardine-like.’ It was innovative, inspiring, and despite their best efforts, only halfway finished (plus 30%) when last year’s R2AK sailed past their Vancouver home. Sometimes an idea needs a little more time, specifically twice as much time (plus 30%). This year Seaforth is still madly finishing the boat to get it and its seven crew ready for go time June 3. We’ve seen pictures. We think it turned out great, but have to admit that it looks a little like the carnal alchemy of a magical night between an Airstream trailer and an intrepid canoe with high hopes, a footstool, and nothing to lose. The assembling crew has led lives that have sardined in as much action-packed salty experiences as one possibly can. Their decades on the water span kayak trips up and down the west coast of Canada and such eastern exploits as Baffin Island, and Patagonia-like places so far south it gets cold again. They’ve done scores of trips into remote coastal BC waters, wilderness guiding, professional captains of 70’ sailboats, one was even a Tuna boat captain…which, given the aluminum nature of the boat, has a bit of full circle irony to it. Welcome to the R2AK, Team Seaforth Expeditions. When you get to Ketchikan, tell them Charlie sent you.